Young gardeners working in a large greenhouse. 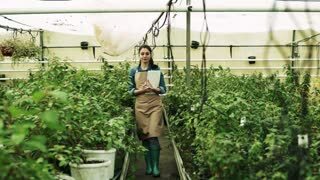 Young woman gardener working in a large greenhouse. 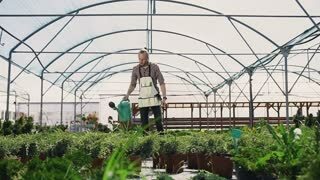 A gardener dressed in an apron work in a large greenhouse, watering plants on a sunny day. Slow motion. General plan. 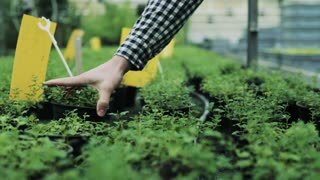 A male gardener works in a greenhouse, watering plants with a green watering can. A sunny day in a greenhouse, drops of water. Slow motion. Young people are workers of the agrarian sector, go greenhouse and examine ornamental plants. 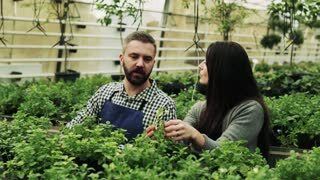 Gardeners, man and girl count the number of flowers in the greenhouse. Slow motion.